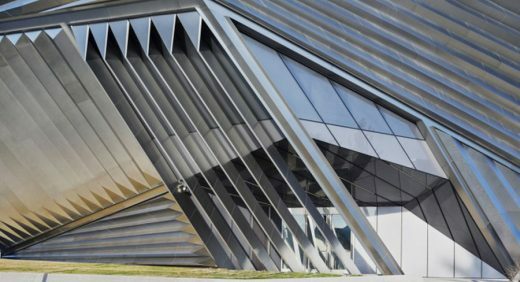 The Eli and Edythe Broad Art Museum at Michigan State University opened this past Saturday at a dedication ceremony attended by 2,000 people, including Eli and Edythe Broad, MSU President Lou Anna Simon, Architect Zaha Hadid and Michigan Gov. Rick Snyder. The facility also includes an education wing, a works-on-paper study center, shop and café. Adjacent to the museum is an expansive outdoor sculpture garden and a large pedestrian plaza. 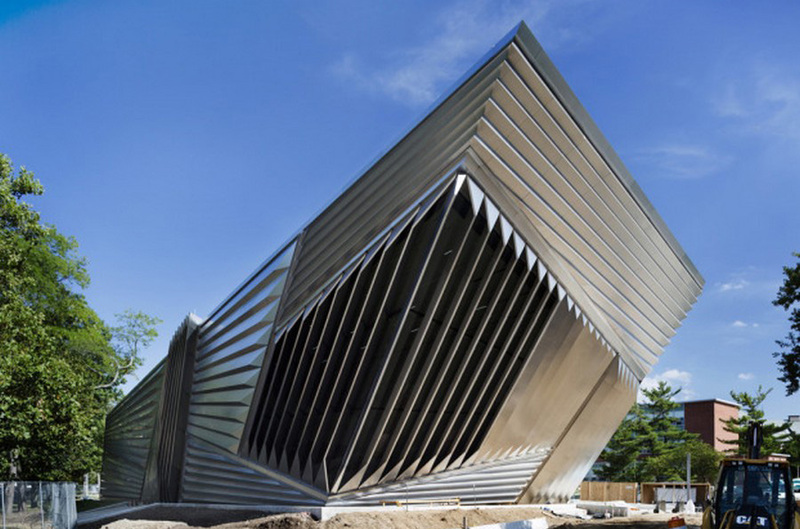 Eli and Edythe Broad contributed the lead gift of $28 million toward the $40 million museum and donated 18 artworks. A study released last week found that the museum is expected to pump nearly $6 million a year into the local economy. Groundbreaking took place on 16 Mar 2010 with Zaha Hadid and donors Edythe Broad and Eli Broad wielding shovels. Zaha Hadid Architects has been selected as the winner in the design competition for the Eli and Edythe Broad Art Museum at Michigan State University. Zaha Hadid joined the Broads at two public events today where MSU President Lou Anna K. Simon announced the winner. The location of the Eli and Edythe Broad Art Museum at the northern Edge of the Michigan State University Campus is infl uenced by a set of movements adjacent to and across it. The vital street life on the northern side of Grand River Avenue and the historic heart of the university campus at the south side generate a network of paths and visual connections.This highly frequented interface between city and campus has an additional layer, the traffic along the Grand River Avenue in east-west-direction. The zebra crossings and the street life on the northern side of the street as well as the bus-stops introduce a traversal movement layer in this part of the Grand River Avenue, slowing down the traffic and creating a focus on the structures along this stretch. The initial momentum for Zaha Hadid Architect’s Design is generated by developing a landscape carpet picking up these loose ends of the urban fabric and interweaving them with the different movement directions across and along the site. This landscape layout develops from an urban end at the western side of the plot. From this Western end, where the plot of the Eli and Edythe Broad Art Museum is neighboured by the large Berkey Hall, the new square exposes the western edge of the site by allowing for a deep insight from west to east along Grand River Avenue.The second main transversal crossing over the plot is a modifi cation of the existing pedestrian connection between the corner of Bailey Street / Grand River Avenue and the East Circle Drive on the campus. This path is used as an entry to the eastern end of the plot, the Landscape-Side, at the interface of Museum to sculpture garden. Between these two North-South Axis linking Campus and City, a pattern of linear movements picking up directions of the surrounding structures is woven forming the base for a landscape carpet, introducing different zones and surfaces to the plot and being the base for folding up the volume of the Eli and Edythe Broad Art Museum. The Eli and Edythe Broad Art Museum building’s appearance embraces the idea of being folded out of the different movements intersecting on the site. The light structure of the outer envelope is a sharp and directed body, a composition of patches on directional pleats, reflecting the landscape carpet’s geometry. It underlines both the movements in and around the site as well as the development from the ‘urban’ western end to the landscape side of the plot facing east. Each patch of the facade picks up a different direction of the composition of the landscape carpet, depicting its origin both at the inside and at the outside of the building. The elongated sculpture of the Eli and Edythe Broad Art Museum building leans against the west in a dramatic gesture, a direct counter movement towards the approaching traffic, forming a raised head with a 40 feet tall front face towards the urban plaza and the volume of the Berkley Hall. From there the volume undertakes a linear and continuous shift in scale to the east side which faces the sculpture garden, where it blends into the landscape at 27 feet height, signifi cantly below the tree tops, mediating between the scales of the large structures and the garden in the east. The east is sculpted by a positive-negative play of building volume and landscape patches, forming a three-sided courtyard with an open inner facade, staging a floating space between galleries and landscape. The outer skin of the Eli and Edythe Broad Art Museum, a structure of stainless steel with a gradual perforation and glass, picks up the play of different directions and orientations by giving each face of a pleat either an opaque or transparent character. It gives the building an ever changing appearance whilst moving past it, at the same time it is used to filter and direct the daylight depending on each gallery’s purpose and orientation. The stainless steel skin on the outside of the building is mirrored in a white ceiling, conveying the pleated profile of each facade patch to the inside of the galleries and providing them with guided and diffused daylight (primarily north-light) through the open faced of the pleats. The choice of materials reflects the building’s clear-cut volume and form and creates a harmonious and clear background ensemble in plaster walls, concrete floor and wooden flooring on the first floor. The abstract white walls let the artwork speak for itself; the slightly changing light directions indicate subtle changes in atmosphere when moving from room to room to form a spatial background. Eli Broad, 76, and MSU alumnus, made his name by running a real estate company (now known as KB Home) and the financial giant SunAmerica.